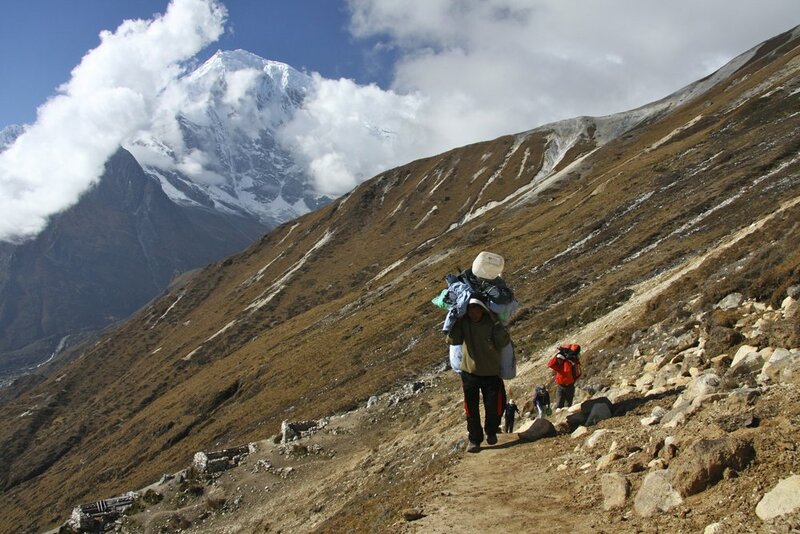 Since the civil war in Nepal ended in 2006, the trekking business resumed in full force. Rajendra from the Mountain Sun Valley Trekking Company organized our trip to Mt. Kailas and it was a great success. We met Rajendra through a fellow from Germany whom we met during our 2005 trip to Pakistan. After our trip to Mt. 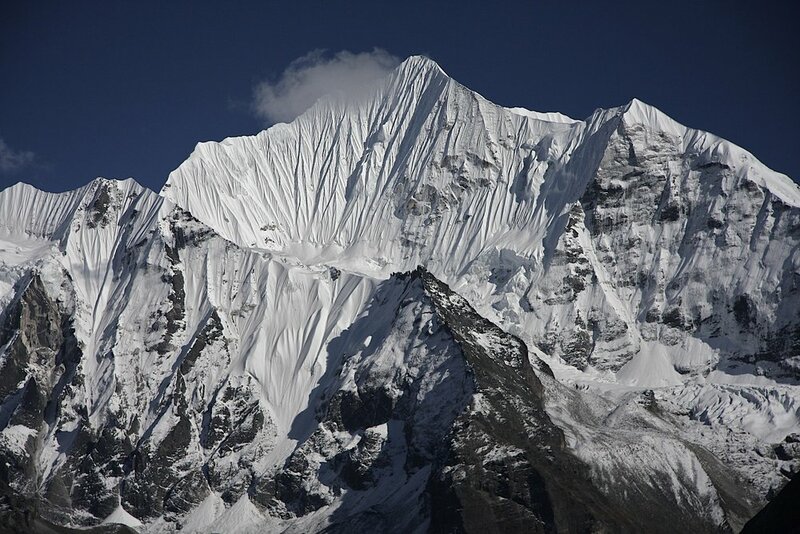 Kailas in 2007, we wanted to do a more involved trek into the high Himalayas. David got bronchitis on the Mt. Kailas trek and needed to recuperate and regain his strength in order to undertake another trek to the high altitudes. In 2009, he felt ready so we decided to go back to Nepal. 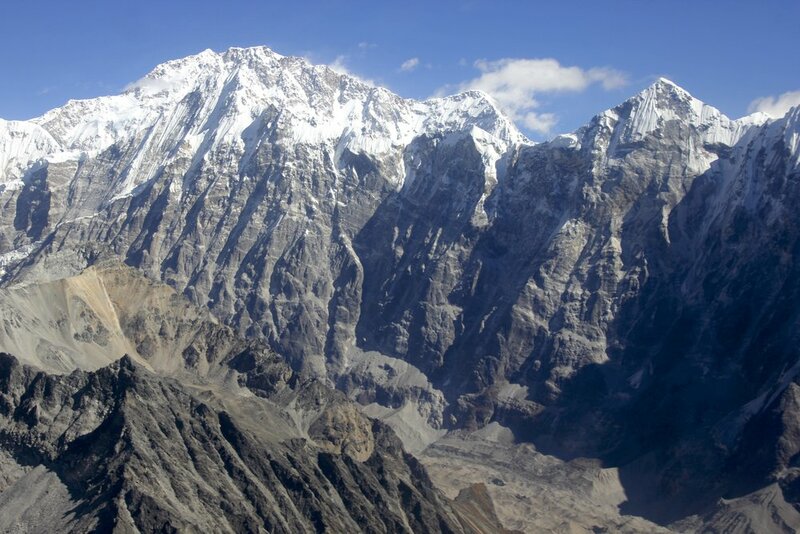 We chose the Langtang area primarily because it would not require any flights or long jeep drives. We basically would start trekking straight out of Kathmandu. This was great, given our memories of cancelled flights and long drives from 2007. Due to the proximity to Kathmandu, the cost of this trek was low (less than $2,000 each). Initially, we planned to climb Yala Peak and Naya Kanga Peak. 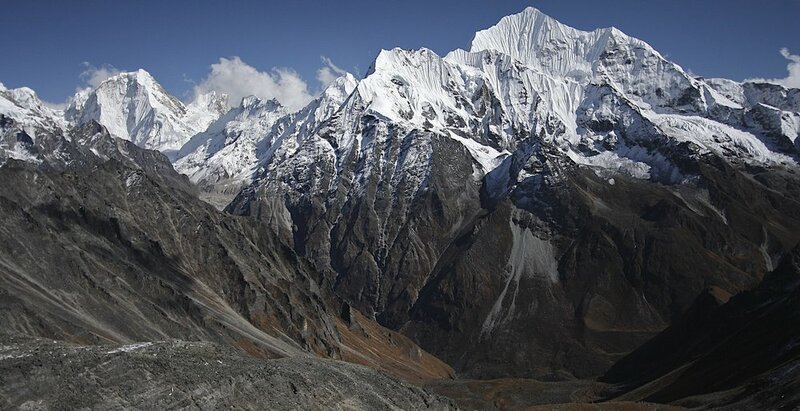 Both mountains are over 5,000m and are great viewpoints to the entire Langtang range. 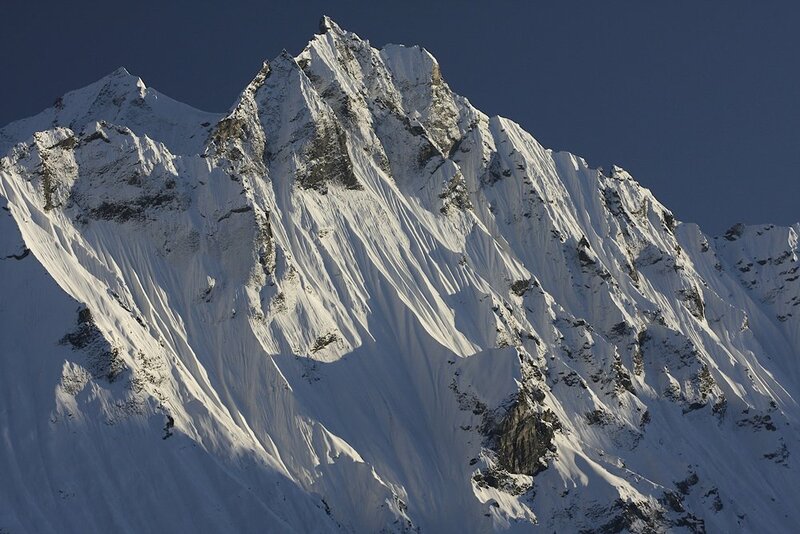 To save money, we did not have a formal permit for the trekking peaks that we wanted to climb. At the end we opted for Yala Peak. We saved a few days of time by not climbing Naya Kanga and we used those days to explore further up the Langtang Valley to the Langtang Glacier. ﻿We arrived in Kathmandu and checked into the Nirvana Garden Hotel. The hotel was around the corner from Rajendra’s office. On this trip, we met Kumar for the first time. Kumar would be our guide on this trek and many subsequent ones. We were quite excited to be there and to be trekking again. This would be my first trek in the heart of the Nepal Himalaya. I did not consider the 2007 Kailas trip to be a true trekking adventure in the Nepal Himalaya. In 2007, we missed a lot of great views in Western Nepal due to the horrible weather we had. I was very curious about the High Himalaya ever since 1996 when I saw the massive glaciers descending from the high peaks during the drive from Lhasa to Kathmandu. I remember that moment: the peaks were hidden in the monsoon clouds and all I could see were the long tongues of ice. It was very mystical and I wanted to go there very much. We took a jeep from the Nirvana Garden Hotel for a short drive to the trailhead in Sundarijal. Sundarijal is a suburb of Kathmandu. This was the shortest drive to the start of any trek ever. We basically drove across Kathmandu. We arrived in a large square with fruit and vegetable market after an hour of crawling through the Kathmandu traffic. The trail ascended a steep and very long flight of stone stairs. The stairs lead to Chisopani, our destination for the day. The climb was 700m and it was quite easy but hot and humid. It was a cloudy day and the weather deteriorated the higher we climbed. It was early October and the monsoon was just ending. Along the way we met a crazy fat American guy with a machete strapped across his belly. He was drenched in sweat and told us that in case of an attack or robbery, he would make use of his machete. We never saw him again. As we got higher, the fog became very thick and we could barely see 50m in front of us. It started to rain right after we checked into the Everest View Hotel in Chisopani (without any views due to thick fog). The place is popular with people from Kathmandu who come here for the views of the Himalaya. 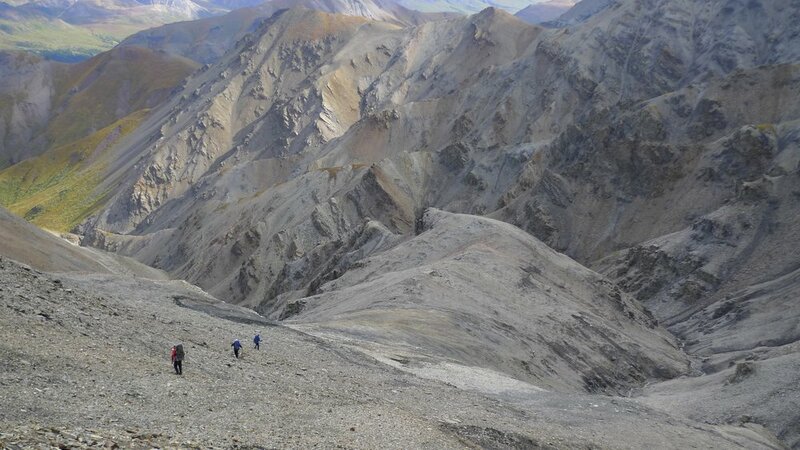 Today we walked for quite a long way along the ridge that descends from the high foothills of the Langtang Range. There were no views as it was raining quite hard. We passed by some remaining ruins of houses destroyed during the bloody Maoist civil war. We saw Maoist slogans painted on walls. The particular house must have been an old check post. 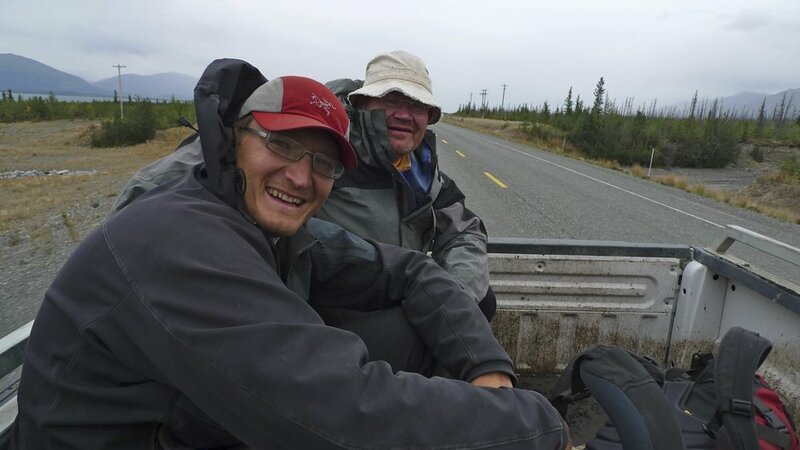 An hour before we reached the hotel, the rain intensified and I considered putting my rain gear on but I did not as I thought that it would not take that much time to get to our destination. Without the rain gear, the monsoon rain drenched me and by the time I reached the hotel I was completely wet. I was wondering whether the monsoon was really over as I vividly remembered our incessant and permanent rain on the Simikot trail in 2007. I was hoping that this would not be a repeat of that experience. In the hotel in Mangengoth, the rooms were quite atmospheric with baby blue walls and Chinese photo collages on the walls. These posters are totally tasteless but they provide a much-needed splash of color in these otherwise drab surroundings. It rained for the remainder of the day and night. In the morning, the rain stopped. It was still overcast and foggy. Again no views in either direction. David told me about the great views from a similar ridge he hiked en route to Paldor. The view was supposed to extend quite far on both sides revealing a panorama of the Himalaya. We had lunch at Ghopte at 3,430m. By the time we left there, the clouds started to lift a little. We left the ridge and the trail took a sharp turn to the left (west) to ascend to Suryakunda. We passed some spectacular waterfalls that looked quite enchanting in the fog. We arrived in Suryakunda in late afternoon. “Flight 311 departed Bangkok at 10:30 local time. It was scheduled to arrive in Kathmandu at 12:55 Nepal Standard Time. [After crossing into Nepalese airspace the pilots contacted air traffic control and were cleared for an instrument approach from the south called the "Sierra VOR Circling Approach" for Runway 20. Nepalese ATC at the time was not equipped with radar. Shortly after reporting the Sierra fix ten miles south of the Kathmandu VOR, the aircraft called ATC asking for a diversion to Calcutta, India because of a "technical problem". [Before ATC could reply, the flight rescinded their previous transmission. The flight was then cleared for a straight-in Sierra approach to Runway 02 and told to report leaving 9,500 feet (2,896 m). The captain asked numerous times for the winds and visibility at the airport, but ATC merely told him that Runway 02 was available. The crash claimed the life of the son of the mayor of Winnipeg. I remember reading about it. The owner of the hotel that we stayed at remembered the crash. After the plane crashed, the locals searched the bodies for cash and valuables before the police and army arrived. His hotel was full of parts and pieces of the airplane. I asked him to give me one of the parts of the airplane that was really a piece of mangled steel. In the late afternoon, the clouds started to part and revealed a great panorama of the Himalayan foothills down below. The rocks surrounding us were quite steep and overgrown with vegetation. The clouds that formed lower down in the lowlands had now an intense orange hew. They looked like orange towers in the sky. We could also see the glow of the lights of Kathmandu lower down. We started in nice sunshine and climbed up to a high pass at 4,165m called Laurbina Pass. At the pass, there were numerous prayer flags. We were the only party on the trail and had the pass to ourselves. From the pass we could see a chain of lakes down below. These lakes are apparently holy to the followers of Hinduism and receive pilgrims in late August. We took photos and admired the great view from the pass. To the north west of us we could see the main lake of Gosainkund. Beyond the ridge flanking the lake, we should be able to see mountains of the Manaslu Range and the Annapurna but due to the afternoon clouds we could not see anything. We descended down to the lake. As the trail approached the lake, we passed by some Hindu shrines with bells and symbols of Hinduism. The clouds were now moving in and we made it to the hotel above the lake shore. After late lunch, I took a walk around the Gosainkund Lake. I was alone and it was strange to have the entire area to myself. The path around the lake is a pilgrimage route and it is supposed to be auspicious to make the round. 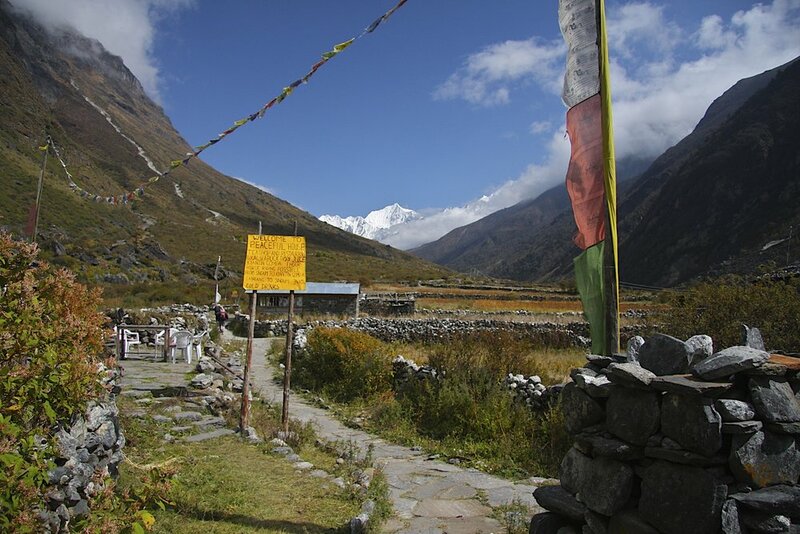 The path is marked with many prayer flags, simple chortens and memorials. The views were great and the lake was crystal clear. I had a great view of the setting sun and multi colored clouds reflecting in the lake. As we left the hotel by the lake, we walked along a rocky path that dropped steeply to the valley below. The river flowing down in the valley below started at the Gosainkund Lake. 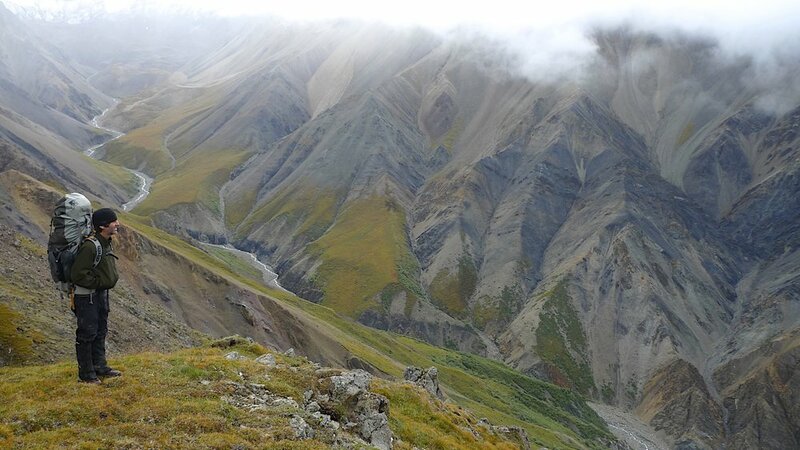 Once we turned the corner along the trail, a great panorama of the Himalayan peaks opened before us. It was very impressive! We descended a little lower to a small Buddhist shrine on the promontory with the best view. The shrine was surrounded by tall poles with prayer flags. From that point, we could see the Ganesh Peaks almost directly ahead. To the left the snow and ice-covered ridge of Langtang Lirung ascended to the clouds above. The peaks in Tibet, far away lined the horizon between Langtang Lirung and the Ganesh Peaks. For a short while we could also see the Manaslu Himal and part of the Annapurna Range but they soon became covered by clouds. We spent quite a while at the viewpoint and took many photos with a zoom lens. The sky was clear, there was little wind and it was magnificent! After we got enough of the views, we descended to a small hotel at Laurbina at 3,900m. 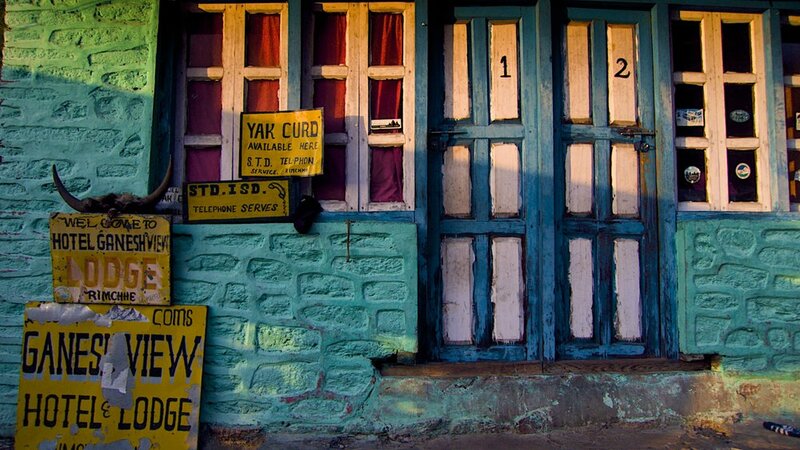 Laurbina is a collection a few tea houses serving pilgrims and trekkers alike. It is located right above the tree line with great views to the valleys and peaks below. The valley of the Langtang River that we would be following into the high mountains was visible below on the right. On the left, behind the ridge was the Valley of Trisuli River. The Trisuli River Valley is one of the main valleys connecting Nepal to Tibet and China. The day was totally overcast and we were entirely in the cloud. We could see absolutely nothing. Since we had the time, we decided to take a day off and wait out the bad weather as we had enough of walking in the clouds and rain. We spent the day in the kitchen of a small hotel eating and chatting. The break gave us an opportunity to get to know Kumar better. He was a really nice guy always smiling and very positive and attentive. Kamsing was his neighbor from the same village and Suri was his cousin. Suri did not speak any English. I would get to know the three of them much better in 2011 on the trek around Manaslu and Annapurna. In the morning, the weather cleared up and we could see the high mountains again, especially Langtang Lirung. We started our steep descent to the Langtang River long way below. It was down, down, down. I thought that it would be quite a workout to be doing this trail in the opposite direction. As we walked lower, the forests of thick old trees with monkeys gave way to fields and houses. The area was quite populated and we walked through many clusters of farms along the way. In late afternoon, we reached Syabru Village. Syabru is a village built on a ridge. This was the Upper Syabru as the Lower Syabru is in the Trisuli Valley and is the road head for the bus to Kathmandu. Upper Syabru Village consisted of a long row of rickety houses. We had a great view of the Langtang Valley from our hotel. The hotel owner claimed to be a Lama and promised to put me in touch with a local shaman. This never materialized to my disappointment. 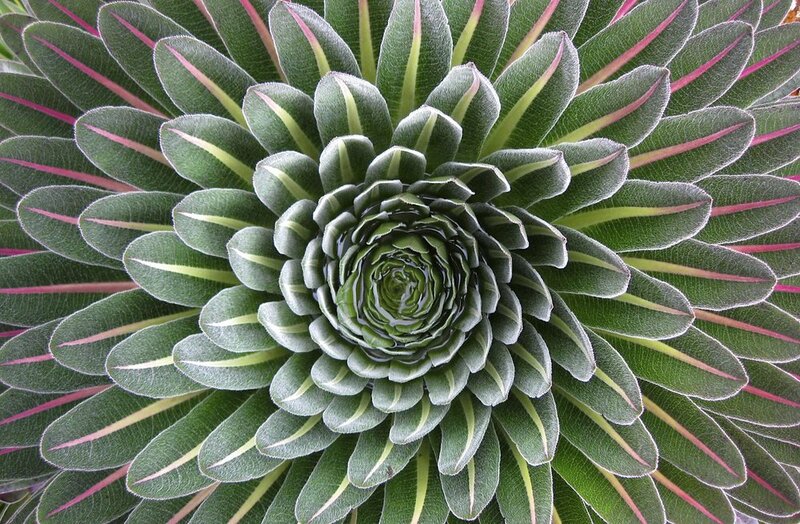 I had a great encounter with a shaman in 1996 in Kathmandu when I was in Nepal for the first time. Patricia Cory, my accidental travel companion at that time was on a mission to find healers offering alternative treatments for her terminal patients from Italy. We ended up visiting a shaman who gave us a performance of his powers in Kathmandu. It was a very powerful experience. Since the Goisakund is known for religious pilgrimages, I thought that maybe, there would be shamans in the villages below the lake. From Syabru, the trail follows the Langtang River that is the main drainage of the Langtang Himal and starts at the Langtang Glacier. 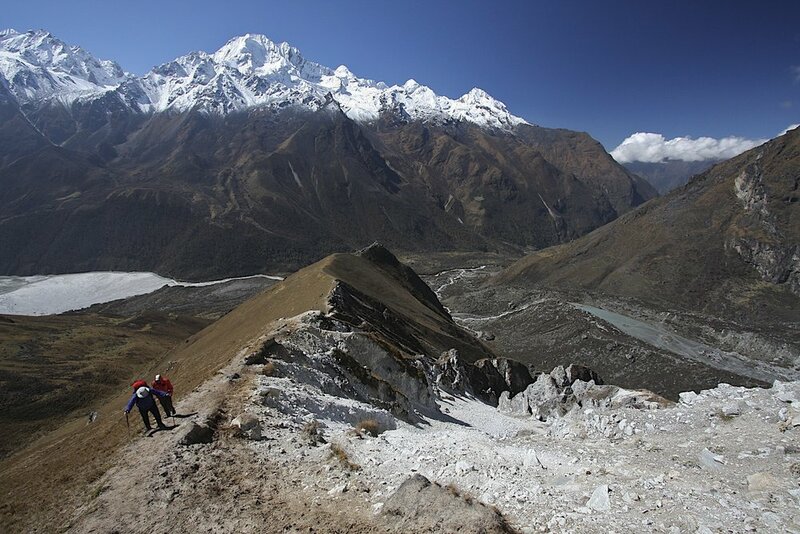 The trail dropped down to the Langtang River. We crossed a long suspension bridge and followed the trail in the thick jungle to the collection of teahouses in a settlement called Bamboo. We had lunch there. It was hot and humid. We dipped our feet in the cold Langtang River for temporary relief from the heat. 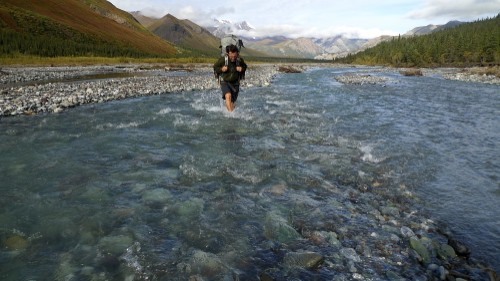 The river was quite turbulent as the descend grade is quite steep at this point. The valley was very narrow and deep. We could not see anything except the steep walls across the river. After the trail started to climb up and ended in the village of Lama Hotel. It was another collection of teahouses. We were now on the main Langtang Valley trekking route and the teahouses were bigger and busier. 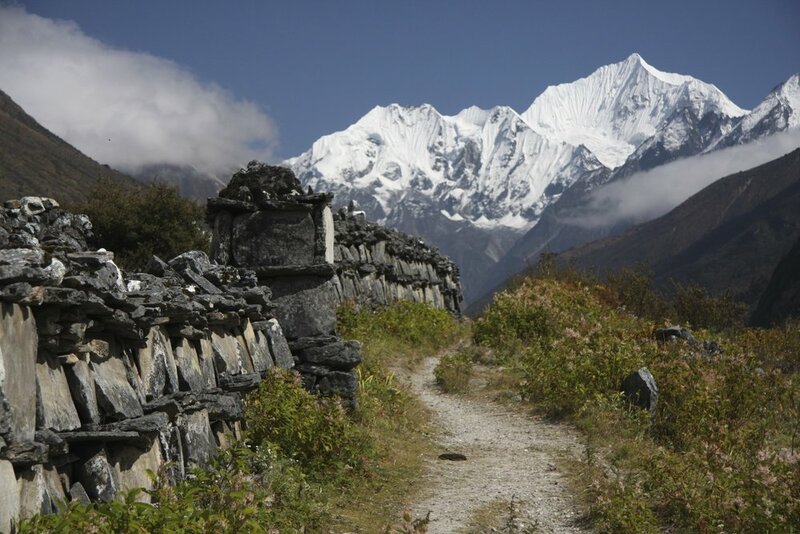 Given the proximity to Kathmandu, this is one of the most accessible and popular treks in Nepal. We walked for another forty minutes to a small settlement with one teahouse where we stayed for the night. 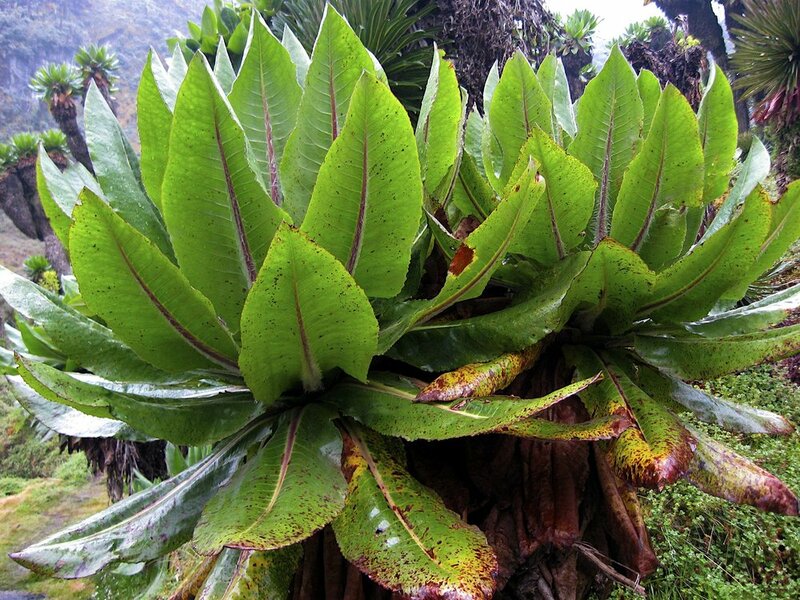 The teahouse was located among huge old trees by the Langtang River. The riverbed was full of huge boulders that rolled down from the mountains during nasty landslides. We started early and hit the Langtang trail checkpoint early in the morning. We presented our trekking permits and continued up to the Langtang Village. 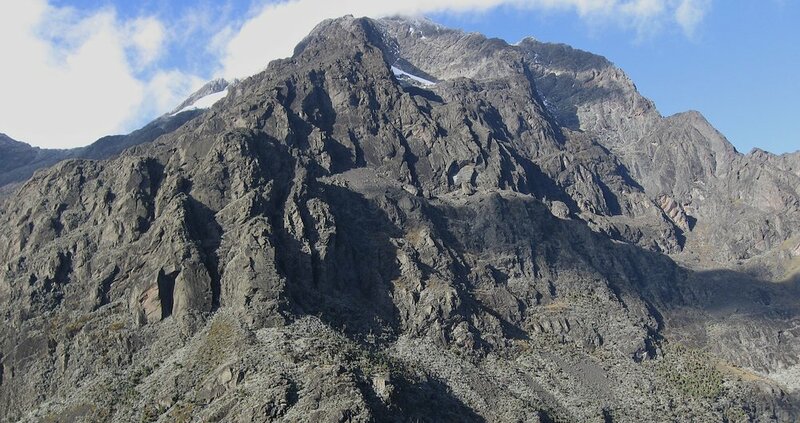 Langtang Village is located directly below the south face of Langtang Lirung. The glaciers and snows above are not visible as the steep walls of the mountain obscure the view. The glacier above terminates in the rocky funnel that looms over the village below. The village is a collection of stone huts spread in the broad valley. From Langtang Village, one can see Ganchempo and other snowy peaks of the High Himalaya at the end of the valley. It was starting to get exciting to be entering the realm of the high mountains. We stopped there for lunch and I made a quick expensive call home. The weather was now sold: blue sky, sunshine and hot. After lunch and basking in the hot sun outside the teahouse, we started our final part of the walk to Kyanjin Gompa. We walked by some impressive and long Mani walls. We also passed some curious contraptions: Buddhist prayer wheels run by a water mill powered by water flow redirected from the stream above. This is lazy Buddhism! As we neared Kyanjin Gompa in late afternoon, the sun was getting lower and soon would hide behind the mountains. The valley was now opening up but the surrounding mountains were also higher and steeper. Just before the village, we climbed a small hill from which we had a fabulous view of the open valley, the Langtang River and Kyanjin Gompa below. Towering over the valley and illuminated by the late afternoon sun, were the snowy peaks of the High Langtang Himal partially obstructed by the afternoon clouds. All peaks had snow and glaciers and were over 6,000m high. The vista was absolutely fantastic and it all looked very atmospheric. To the left of us was the terminus of the Langtang Lirung Glacier. Kyanjin Gompa must be one of the most beautiful villages in the entire Himalaya. We descended the small hill to the village below passing a small temple (gompa) and the local cheese factory. After dinner, I took a walk to the moraines above the gompa with a fine view of the East Ridge of Langtang Lirung. The last rays of the setting sun illuminated the high mountain. It felt like we were finally among the high peaks that we came here to see. We needed to acclimatize for our climb of the Yala Peak. 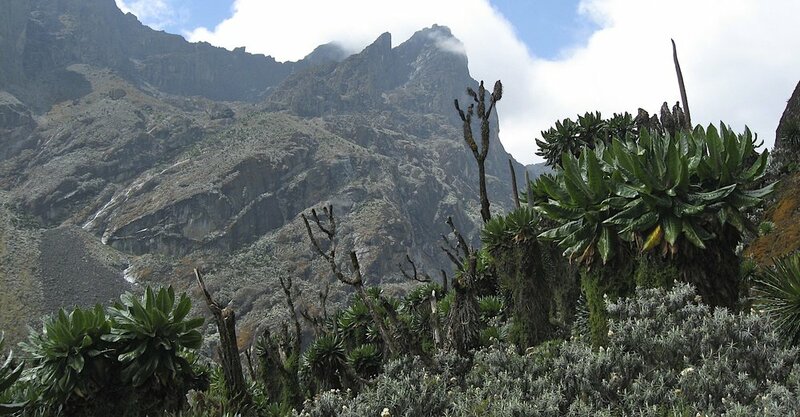 Yala Peak is 5,500m high and it would take us two days to do the climb. For our acclimatization, we had a choice to go to the base camp of Langtang Lirung or climb the hills above the village for magnificent views of the surrounding mountains. 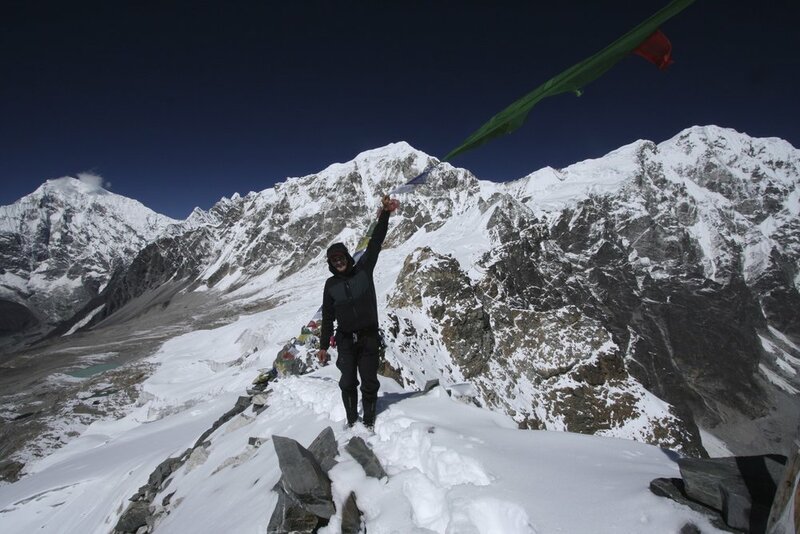 Unbeknown to us, Tomas Humar was climbing Langtang Lirung and he was in the base camp at that time. Unfortunately he died on that climb two weeks after. Finally we decided to for a walk to the hills above the village to 4,500m. The view to the Langtang Lirung was very impressive as it is one of the major peaks in the Himalayan chain. We could also see the way to the Yala Peak and the climbing route to Naya Kanga across the valley. After our walk, Kumar negotiated assistance of a local guide to help us with the Yala Peak climb. Since we did not have a permit, we needed to pay off a local goon. For a while, it looked like we would not be able to do it but I guess it was all part of the negotiation. We left in late morning and climbed back up the hill above Kyanjin Gompa. We traversed a long slope and arrived at the Yala Peak BC in late afternoon. We camped in a yak pasture with threatening Yaks all around us. In the evening, we had a fabulous sunset with great colours for photography. We got up around 5.30 and left the camp at first light. We had clear weather and great sunrise with white peaks all around. The snow line was at 5000m making everything look very alpine. We climbed for a few hours and arrived at the rocky outcrop that is the main summit in late morning. In order to gain the main summit, we needed to traverse a short section along a steep ridge dropping to the Shalbachum Glacier below. It was quite beautiful. We finally arrived at the summit at 5,580m. The view from the summit was outstanding. 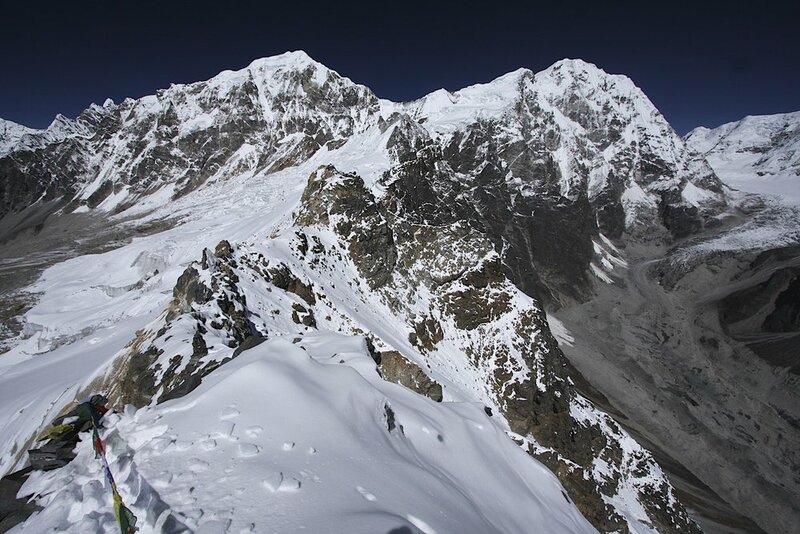 We could see the Shalbachum Glacier below, Shishapangma peaking from behind the ridge across, Penthang Karpo Ri, Langshisa Ri and Langshisa Glacier directly ahead. 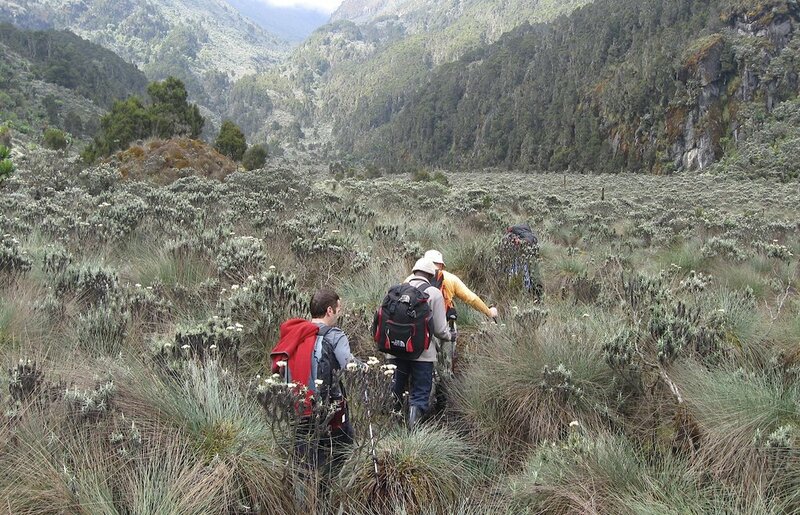 We could also see the peaks across the Langtang Valley with Naya Kanga and Ganja La Pass. To the west, we could see the entire bulk of Langtang Lirung. We had a beautiful weather and very good visibility. We took many photos and lingered on the summit for quite some time. We were the only people there. The fine weather held for the remainder of the day. As the afternoon approached, we descended back to the BC retracing our steps on the snow and glacier with fantastic views all around. It is such a beautiful valley! 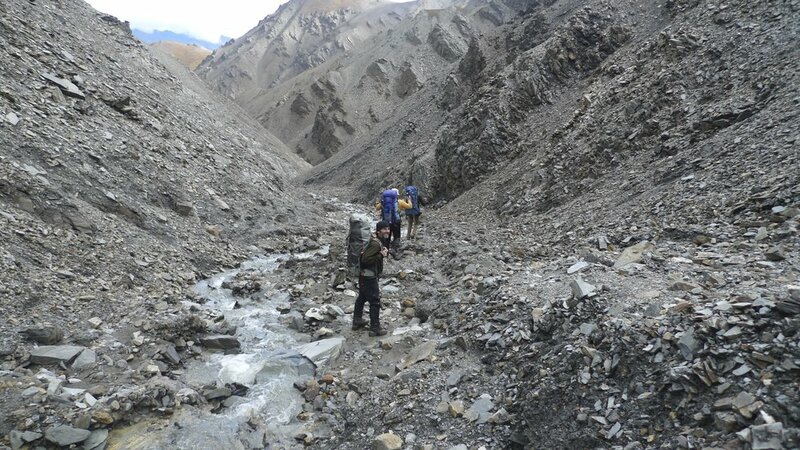 Instead of walking back to Kyanjing Gompa, we decided to drop down the slope to the east to arrive at Langshisa Kharka. 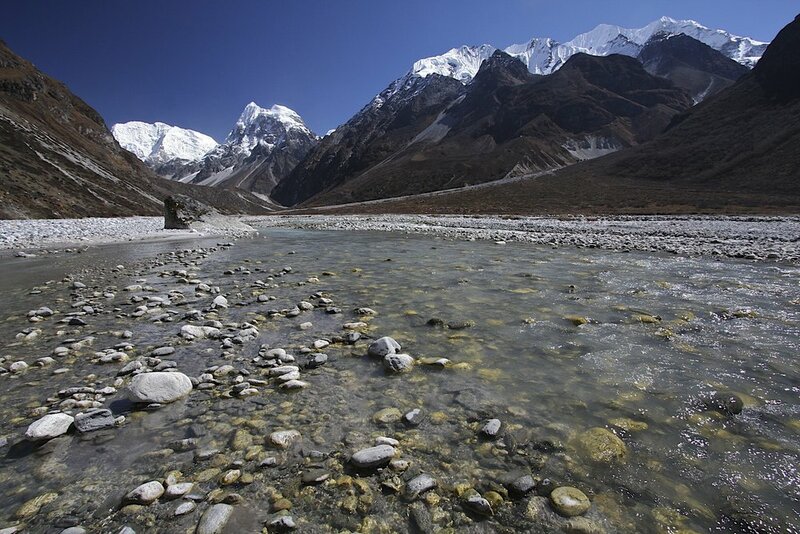 We descended down a slope all the way to the Langtang River and then followed the river to Langshisa Kharka. We arrived there around 2pm. Right before the Langshisa Kharka, we stopped at a small viewpoint and got the first glimpse of the Langtang Glacier. We did not realize that the glacier is 10km away from the campsite and that it also continues for another 15 km to its terminus. Deceived by how close it seemed, we decided to go to the Langtang Glacier for the afternoon walk. Of course the distances here are very deceptive due to the scale of the terrain. 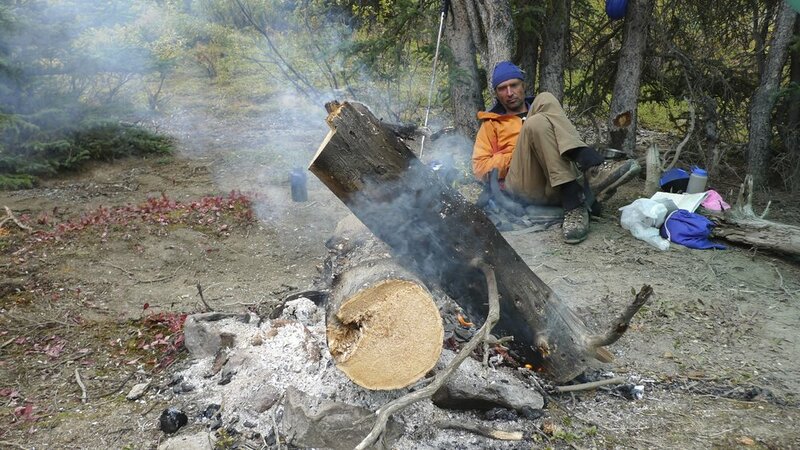 We left the camp at 2.30 pm (it gets dark around 6 and it was 10 km to get there with a 600m elevation gain). We arrived at the snout of the Langtang Glacier at very late afternoon. We had a fabulous sunset on Langshisa Ri Peak 6,427m and Penthang Kharpo Ri directly across the Langtang Glacier. Suddenly we realized that we were both wearing our sunglasses and did not have our regular glasses with us! It was getting dark and we could not see very well with our dark lenses. We got caught in the dark and thankfully Kumar came with the flashlight to meet us. I was just following Kamsing’s runners that had a reflective stripe. Without glasses I could not see the many rocks that dotted the trail. With the glasses I could not see them either so I was screwed both ways! We got to camp tired. It was a fabulous sortie though into a beautiful valley that would warrant further exploration had we had more time. According to David’s recollection of events:-): “this is an entirely fictitious account (above)! What actually happened is that 4 of us went to see the glacier: you, me, Kumar and Kamsing. It happened that you and Kamsing were far ahead of me and Kumar. Kumar and I realised at a certain point that we would have to turn back to avoid walking in the dark, but no amount of waving and shouting could attract your attention, so we were forced to continue to avoid getting further separated. Thus we ended up night walking in the Himalaya. “We could not see very well…” Understatement! I could not see at all! I had to hold Kumar’s arm to find the way and avoid obstacles. It was not Kumar but the one who stayed behind - Suri? - who came with the flashlight. I remember that to your credit you did acknowledge that it was all your fault. I was not happy.” But it gave us something to remember forever! Today we had a long walk back to Kyanjing Gompa; it seemed long, as we were tired. We walked in the windy and sandy riverbed. Small loose rocks were whipped up by the wind. David got sick as he was quite under dressed for the weather. We arrived at Kyanjin Gompa in the afternoon and the valley was filled with clouds. I guess we were very lucky with fine weather during our Yala Peak adventure. In Kyanjin Gompa we stayed at the same hotel. The hotel has a very nice lady working in the kitchen with a nice kid helper. We also met some Danes who told us that Denmark is an unhappy place. I gave them my “Trekking in the Langtang” book. In the afternoon we wandered to the cheese factory to buy some local yak cheese. 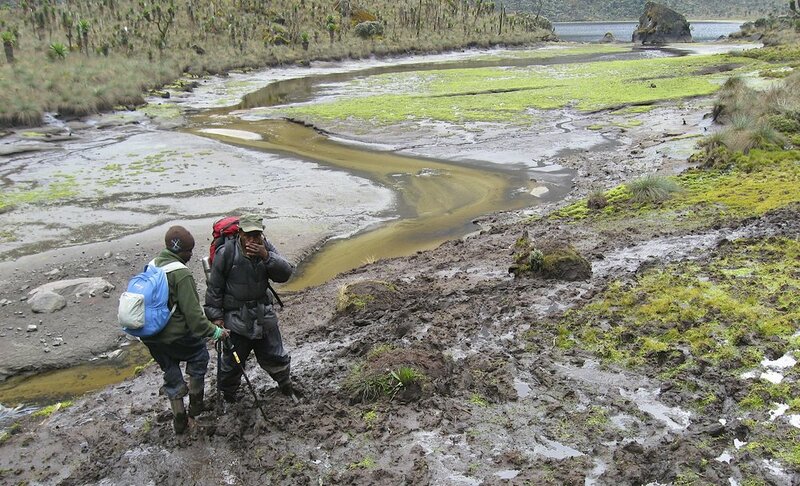 The walk down the valley was fast and easy as we were well acclimatized by this time. Since we were retracing our steps, the walk seemed long. It was mainly through a forest with no views. It seemed, as it would never end! The trail had a lot of small ups and downs. We could not find any rooms at the first village so we needed to carry on to the next camp. There I met a German man who had been to Nepal 11 times (I was shocked and thought how could he visit the same place so many times. Little did I suspect that I would catch the same bug!). A relaxing lunch at Pahare Hotel and arrived in the village of Syabrubesi in late afternoon. 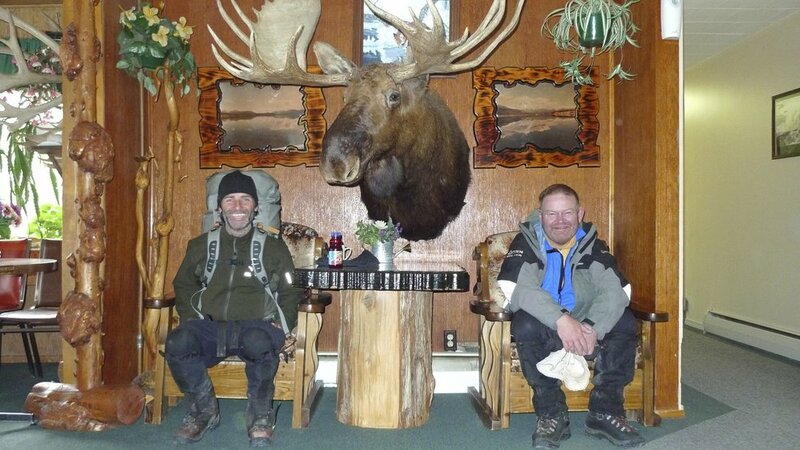 We were happy to be done and celebrated our conclusion to the trek with a cold beer. I had no plans to come back to Nepal at that time. We had a nice trek but Pakistan seemed better but unfortunately more dangerous. We took a long jeep ride back to Kathmandu stopping at a beautifully restored farm (The Famous Farm in Nuwakot, near Trisuli Bazaar. http://thefamousfarm.com). We had nice views to the valley below with high peaks on the horizon. We passed by many overloaded buses on dirt roads. We arrived in KTM after dark. The road had numerous switchbacks and although the distance was only 60km, it took the entire day to drive. October 22, 2009 Kathmandu – shopping, Pilgrim bookshop, food at the restaurant run by the disabled. The Langtang National Park. 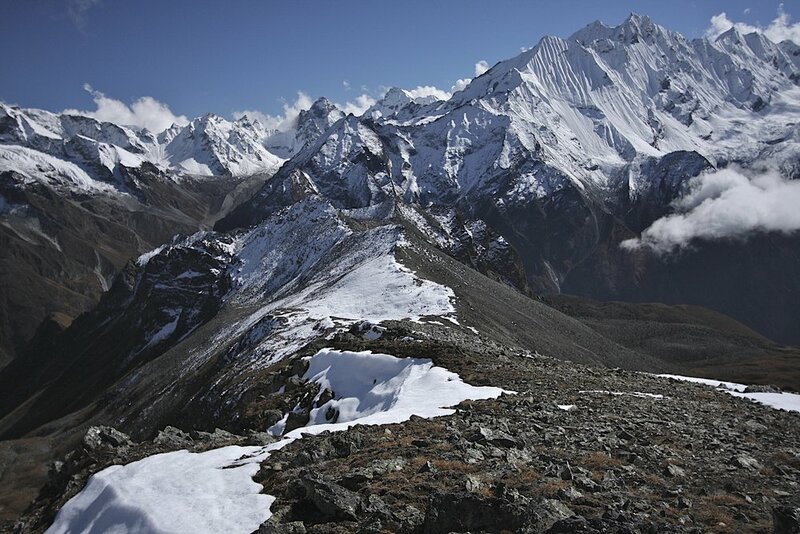 Our route followed the Langtang Khola with the trek up the Yala Peak 5,520m. We came up from Kathmandu via Ghost, Gosainkuda Lakes, Syabru, Bamboo, Langtang Village, to Langshisa Kharka. We then hiked up to the Langtang Glacier but lack of time did not allow for further exploration. 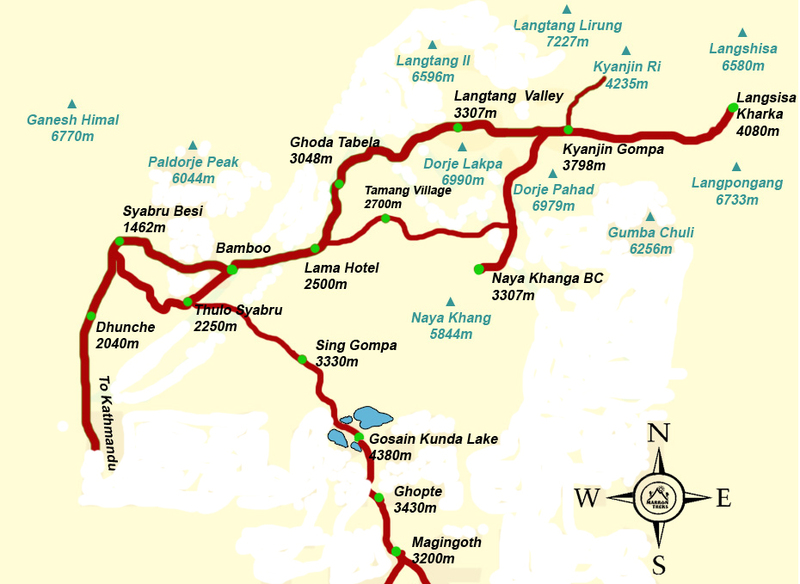 The trek was around 170km in total distance covered (excluding the Yala Peak portion). Gosainkunda Lake is one of the holiest places in Nepal with large pilgrimages arriving in August. 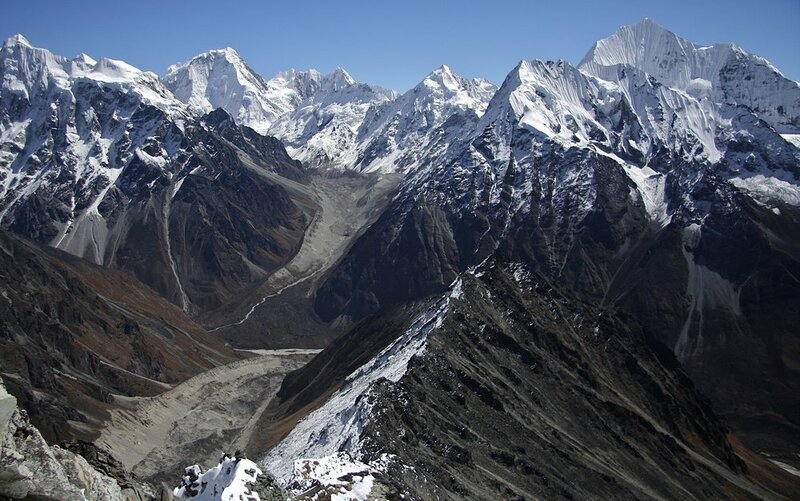 The portion of the Langtang Himmal in this photo is in Tibet (China). Tibetan Langtang visible from Nepal. Langtang Village buried by the earthquake of 2014 by the avalanche from the glacier visible above the rocky cliffs. The final stretch of the trail to Kyanjing Gompa. 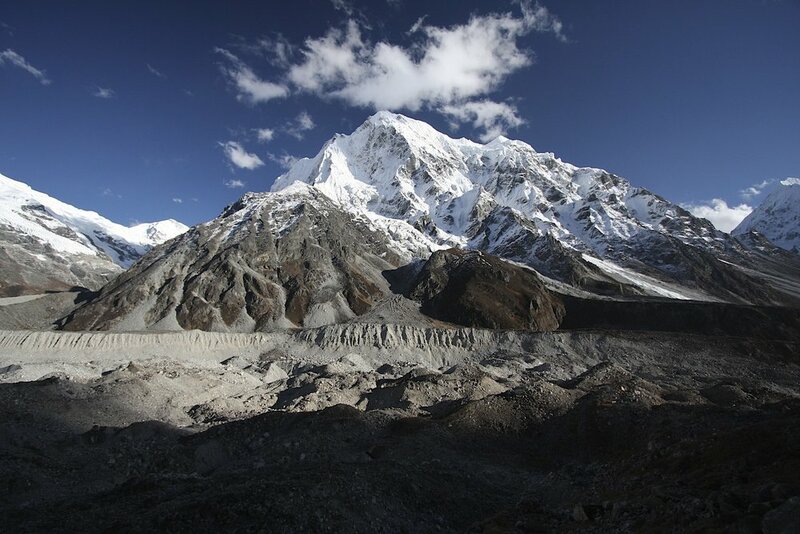 Langtang Lirung Glacier and basecamp. The tent of late Tomasz Humar is visible by the moraine in the centre. 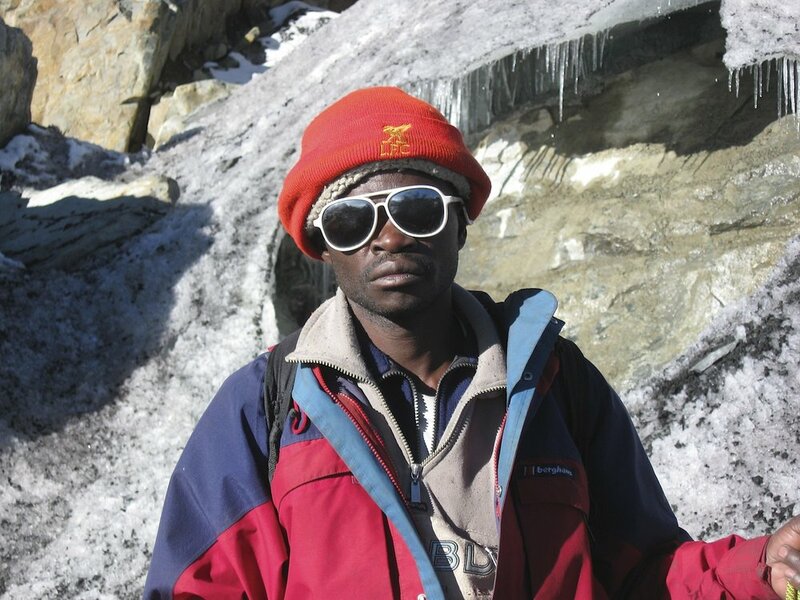 He died a few days after this photo was taken on the rocky slopes of Langtang Lirung above the BC on the ridge visible on the left side of the photo. 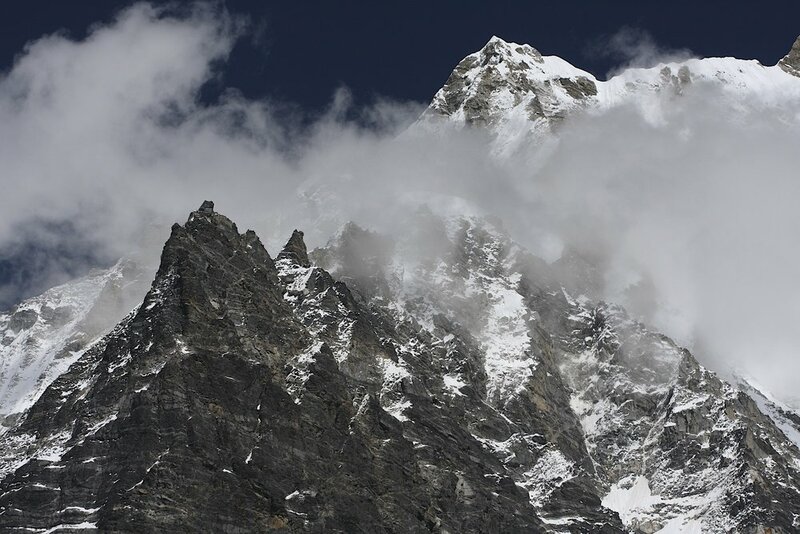 Ganchempo 6,387m. The Tilman Pass is behind the snowy ridge not he left. Ganchempo in beautiful sunset light from Yala Peak BC. View to Morimoto Peak and Shishapagma. On the left is Pemthang Karpo Ri. 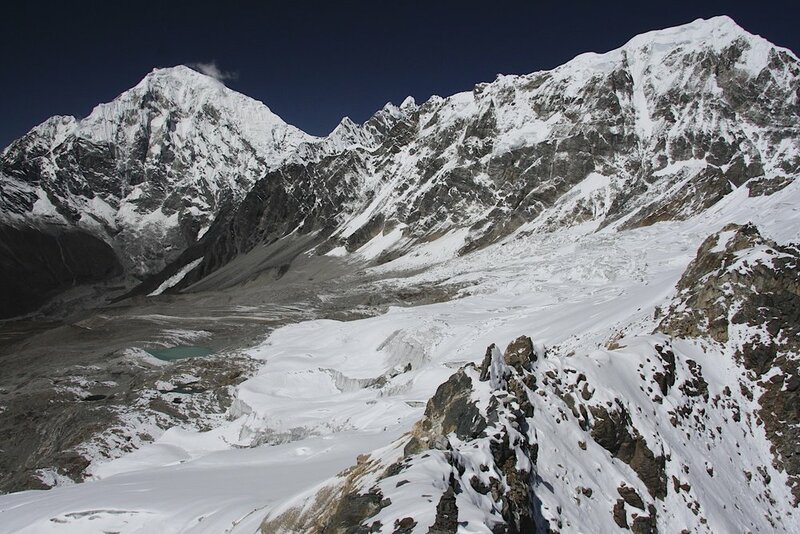 Closeup of Langshisa Glacier. The Tilman Pass is on the right (not visible). Descending from Yala Peak. The Langtang Valley below. Langtang Glacier and Langshisa Ri Mountain. Langtang Glacier and Pemthang Karpo Ri Mountain. Going back to Kathmandu after hiking down the Langtang Valley. 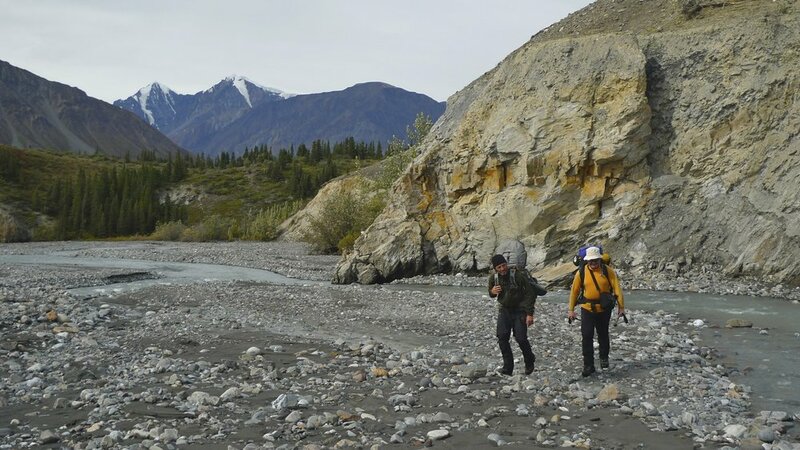 The trek is about 10 days and covers a distance of 50 km. 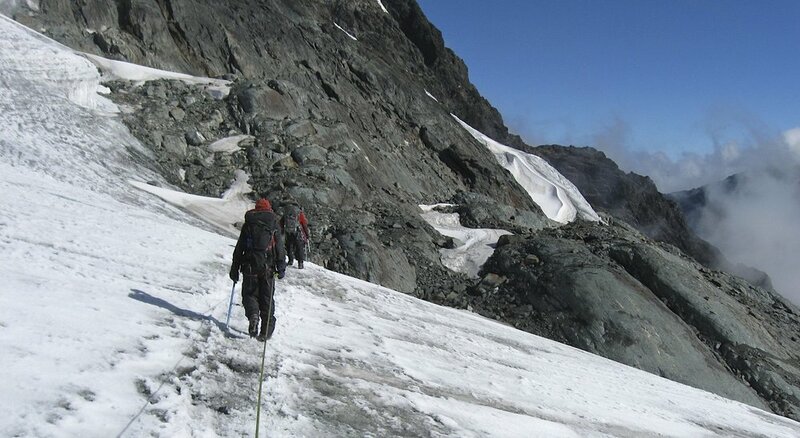 It traverses 2 passes around 4,500m/ Along the way, it is possible to ascend Mt. Speke and Mt. Margarita. 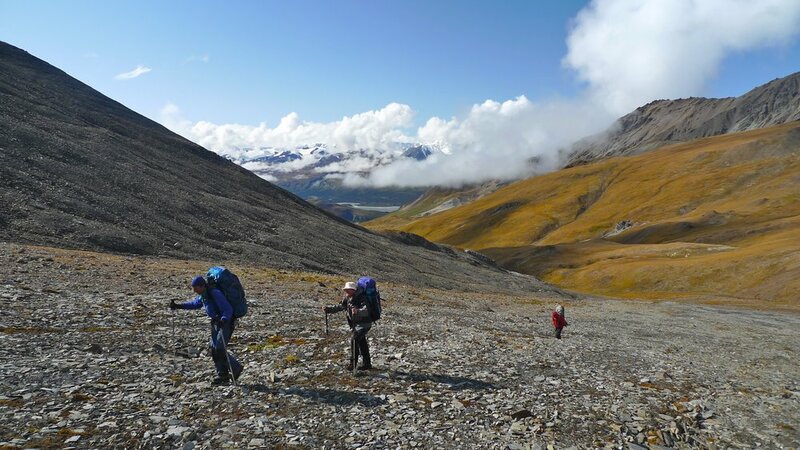 Although not long, the trek is strenuous due to the challenging terrain.